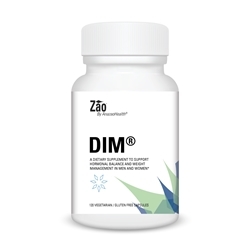 Zao® DIM is a unique formulation that improves metabolism and supports health by adjusting the balance of testosterone and estrogen in both men and women. It stimulates the breakdown (metabolism) of estrogen into "good" estrogen metabolites known as 2-hydroxy estrogens (2-methoxy-estradiol and 2-methoxy-estrone) which are metabolized from the active estrogen, Estradiol. Take 1 capsule with food, 1 to 2 times daily or as directed by your health care practitioner. For weight management, take 2 capsules twice daily with a snack between meals. Serving size is 1 capsule: DIM® 75 mg DIM® is a proprietary blend of Diindolylmethane, Vitamin E as d-alpha tocopheryl succinate and Phosphatidylcholine. Other ingredients: rice flour, gelatin, vegetable stearate. This product is free of citrus, corn, egg, gluten, milk, rice, sodium, wheat, yeast, added sugars, starches, synthetic dyes, artificial flavorings and preservatives. Allergy Information: This product contains phosphatidycholine (from soy).